Theodoros N. Arvanitis is a Professor of e-Health Innovation and Head of Research at The Institute of Digital Healthcare, WMG, at University of Warwick. He is also an Affiliate Professor at Warwick Medical School. Within WMG, he leads the Biomedical Informatics, Imaging and Healthcare Technologies Research Group. He received his RT (BSc) degree (medical radiological technology) in 1990, from the Technological Educational Institute of Athens, Greece, and his DPhil (biomedical engineering) in 1997 from the University of Sussex, UK. Prior to joining the University of Warwick in 2013, he held various posts at the University of Sussex and the University of Birmingham. His postdoctoral work at the University of Sussex included a lab director/research fellow post at the Trafford Centre for Medical Research (1995) and a full-time lectureship in the School of Cognitive and Computer Sciences (1995-1998). In 1998, he joined the School of Electronic, Electrical & Computer Engineering, University of Birmingham, UK, as a full-time Lecturer (1998-2003), Senior Lecturer (2003-2007) and subsequently Reader in Biomedical Informatics, Signals and Systems (2007-2013). He has held the post of co-Director of the West Midlands Academic Health Science Network (WM AHSN) Digital Theme (2014-2016). His research interests span the areas of biomedical engineering, neuroimaging and health informatics. 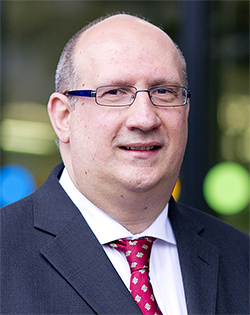 Professor Arvanitis has a substantial academic publication record (h-index=29 with a total of 2732 @ scholar google), while he has received research funding from national (UK), European and international governmental funding agencies, charities and industry. Theo has been involved in UK (BSI) and EU (CEN) standardisation work, while he has recently contributed work in various working groups of the US National Cancer Institute Cancer Biomedical Informatics Grid (CaBIG) effort. He is a Charted Engineer (CEng), Fellow of the Royal Society of Medicine (FRSM and a member of various scientific and professional groups (IET, AMIA, NYAS, RCS, ISMRM). He is also the Joint Editor-in-Chief at the Digital Health, open access peer-reviewed, journal, published by Sage Publications, UK.